RUN LIKE HELL IS OFFICIALLY RELEASED! | Musings of a Scary Horror Writer. RUN LIKE HELL IS OFFICIALLY RELEASED! No, this journey can’t actually have an ending, can it? Run Like Hell couldn’t possibly be physically printed and released… could it? …COULD IT??? It can. And it is. RUN LIKE HELL IS OUT TO THE WORLD BABY! Here is the OFFICIAL RUN LIKE HELL PAGE. You can go to your local comic book store, various online retailers, or you can even buy it right here on this very site! Here’s a wonderful little link for you to do just that. PURCHASE RUN LIKE HELL HERE. Phew… Yep, that’s one hell of an exhale. 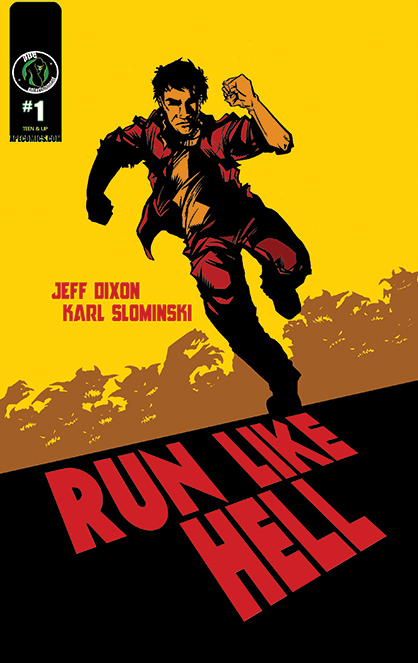 This entry was posted in Run Like Hell and tagged APE Entertainment, graphic novel, horror books, horror graphic novels, Karl Slominski, run like hell. Bookmark the permalink. 10/31/14 – 2014 OCTOBER HORROR MOVIE RECOMMENDATION #31 – Trick ‘r Treat. Let’s finally discuss what happened with my show and Jamie Lee Curtis. Pingback: Let’s finally discuss what happened with Jamie Lee Curtis. 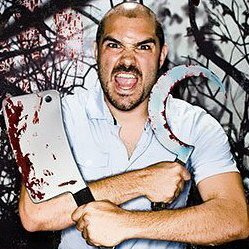 | Musings of a Scary Horror Writer.